CONCORD, N.H. — Sarah Ayres was feeling a bit nervous Monday morning as she drove down a deserted dirt road in Enfield, unsure if she would find the house she was supposed to visit. Canvassing for President Barack Obama on the campaign’s final day, she turned onto a long driveway, got out of her car, and was met by a friendly, white goat. “This year, perhaps more than ever before, the eyes of the world and the nation are on New Hampshire, and once again, our four electoral votes could determine the outcome of the presidential election,” Gov. John Lynch said Sunday, introducing President Barack Obama and former President Bill Clinton at a rally in Concord. 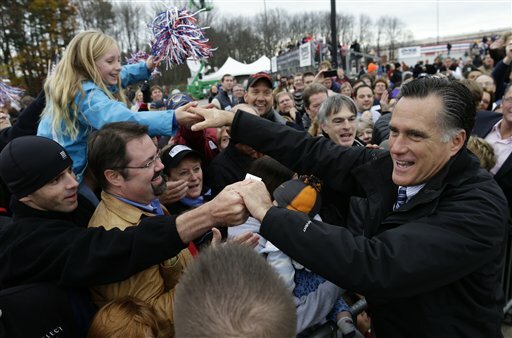 The outdoor event was bookended by Republican Mitt Romney, who had a rally in Portsmouth on Saturday and was returning Monday night for an appearance with singer Kid Rock in Manchester. For Romney volunteer Scott Giesecke, Monday marked the culmination of months of sign waving, door knocking and phone banking. He spent Sunday going door-to-door and was in the campaign headquarters in Bedford by 9 a.m. Monday to make more calls. By 10, the place was crowded with other volunteers. Some of the folks he spoke to Sunday said they have unplugged their phones to avoid the constant calls from both candidates and outside groups. “They’ve just been hammered,” said Giesecke, 44, of Manchester. Most of the voters he spoke to Monday said they were backing Romney, though some didn’t stay on the line long enough to question. 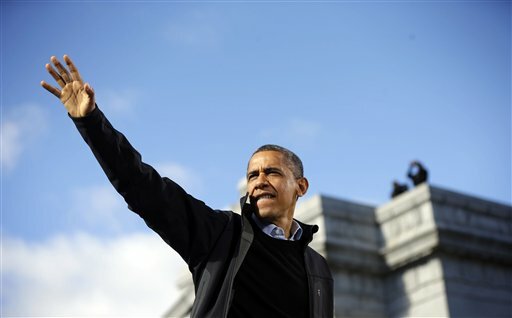 A WMUR-TV Granite State Poll released Sunday night showed Obama slightly ahead of Romney in New Hampshire. In the gubernatorial race — where Lynch’s retirement is leaving an open seat for the first time in a decade — the poll showed Democrat Maggie Hassan leading Republican Ovide Lamontagne, with 12 percent undecided. Democrat Ann McLane Kuster had a slight lead over Republican Rep. Charles Bass in the 2nd Congressional District, while Republican Rep. Frank Guinta and Democrat Carol Shea-Porter were tied in the 1st District. Both races are rematches of 2010. Hassan was attending a get-out-the-vote rally Monday with Lynch in Nashua, while Lamontagne planned to join Romney in Manchester. All four candidates in the Congressional races also were spending the day shaking hands and greeting voters around the state. Ayres, who grew up in Hanover and was home for a few days volunteering for Obama, said the campaign was zeroing on people who’ve said they support the president and reminding them to vote. In some cases, volunteers were being sent to the same homes multiple times Monday if a voter wasn’t around earlier in the day, she said. Voters also will cast ballots for 400 state House seats and 24 state Senate seats. Republicans hold 18 of the Senate seats currently to Democrats’ five seats with one vacancy. The number in the House is 288 Republican to 102 Democrats with 10 vacancies. Both sides expect the chambers to be more closely divided after the election. Secretary of State William Gardner is predicting 722,000, or 70 percent of New Hampshire’s voting age population will cast ballots. More than 808,000 people are registered, and voters also can register at the polls. Assistant Secretary of State Karen Ladd says voters should be prepared for long lines. For the first time, voters must show photo identification or sign an affidavit to vote, and the ballot is lengthy, with two proposed constitutional amendments. New Hampshire, home to the first-in-the-nation presidential primary, also has some of the earliest general election voting. Two communities, Dixville and Hart’s Location, open their polls at midnight for their combined 46 voters.